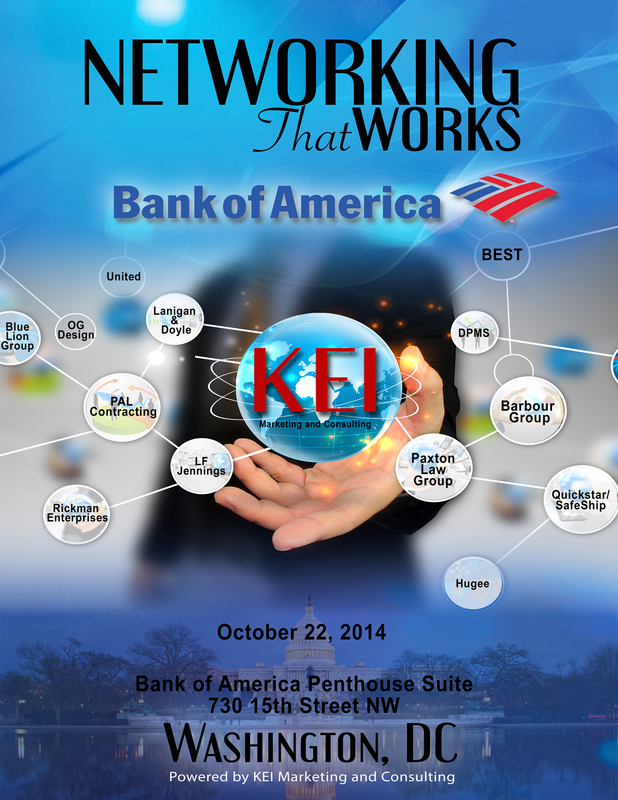 KEI hosted a Signature Program Series “Networking That Works” on Wednesday, October 22, 2014, 5:00pm – 8:00pm at Bank of America luxurious Penthouse Suite in Washington, DC. “Networking That Works” kicks off this series with an event co-sponsored by Bank of America, KEI, and BEST. Our objective is to identify small, minority, and emerging contractors and businesses that can meet the needs of large mega infrastructure projects and commercial and mixed use real estate development thru the utilization of teaming and joint venture relationships. Bank of America Small Business Outreach Division offers a diverse portfolio of products and services dedicated to helping small, minority-owned businesses achieve this goal. We are serious about success and hope you come prepared to discuss a “Plan of Action” with key stakeholders and decision-makers in the construction industry.